AAA Coated. We get our products directly from manufacturer with very strict QC and our product image represent products SOLD and SHOP ONLY by WORLD-PAPER. We do not have any authorized re-sellers. 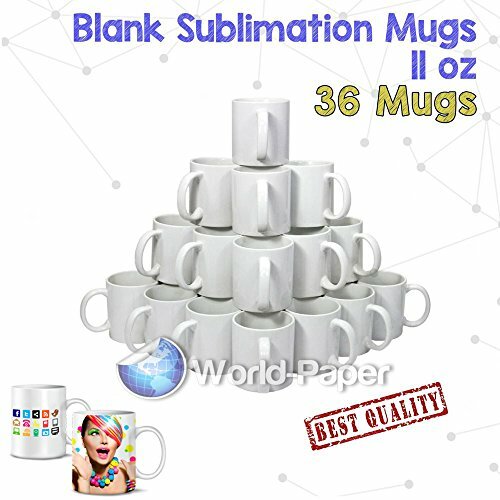 Of you purchase this product from any other seller OTHER THAN WORLD PAPER under this listing, we are not responsible for any quality or coating issues on sublimation goods sold / ship by any OTHER Amazon sellers. ITEM DESCRIPTION: These 11 oz mugs have a smooth bright, white coated surface. The straight sides are ideal for sublimation printing with a heat press. INSTRUCTIONS: • Set the temperature of your press to 180c and put 180 seconds on the timer. • Mirror the image before you print it on sublimation paper. • Use high heat proof tape to secure the paper tightly around the mug. • Do not preheat the mug. As soon as the sublimation paper touches heat the image will activate. Make sure it is centered in the cuff and the handle of the mug is to the far left. • Press down the lever. If you use a World Paper mug press the timer will start automatically each time. • Just wait for the beep and release the mug from the machine. Be careful, it's hot. Make sure to only hold it by the handle. 36 Mugs Ready For Sublimation 11 OZ. AAA Coating Bright and White. white ceramic mugs are perfect for making photo mugs, promotions, gifts, personal keepsakes, artwork showcasing, and much more.